This is the big one. 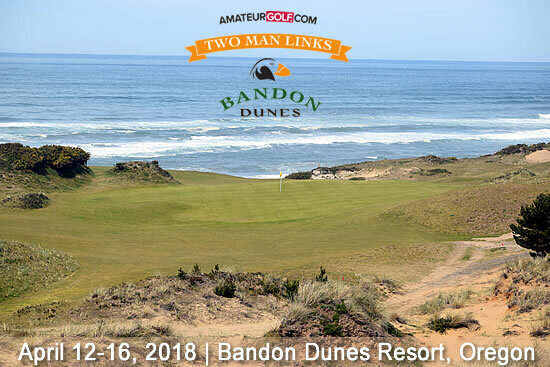 Join us for the 17th annual playing of AmateurGolf.com's flagship best-ball event at the highly-acclaimed Bandon Dunes Resort. The tournament features Scratch, Senior Scratch, and Net Divisions and it always draws a diverse group of players from across the U.S. and Canada. - Tournament Awards immediately following play at St. Andrews room. Pairings for Round 1 on Monday April 16 follow. In 2002, amateurgolf.com visited Bandon Dunes for the first time with 24 players. We have come back every year, with average fields ranging from 60 to 80 players. 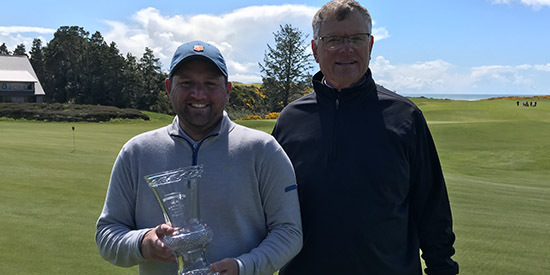 The host courses, Bandon Dunes, Pacific Dunes, Bandon Trails, and Old Macdonald in Oregon have firmly rooted themselves as some of the top courses in the world; they are running out of wall space in the Lodge on which to display the course and destination awards that keep accumulating. The Lily Pond Rooms offer the resort's best value for overnight lodging. Just a wedge shot from the Lodge, a paved walking trail connects the Lily Pond Rooms to the Lodge and first tee at Bandon Dunes. Spacious sitting area, two queen beds, fireplace, and private bathroom. Each room has either a balcony or patio with a view of a natural lily pond. Chrome Lake Lofts are extremely popular with our tournament players, and have sold out many years. Each Chrome Lake Loft offers a spacious sitting area and two bedrooms, each with one king bed and separate bathroom. In the sitting area, a vaulted ceiling opens the room to two adjacent alcoves, one with a fireplace and the other that serves as a card room. You can't go wrong with the setting, overlooking the lake or surrounding forest. Every year we reserve a few single rooms, each with one king bed, for those that prefer the convenience and solitude of The Inn. Located a short walk from the main lodge, The Inn offers its own sitting area and library, the perfect place to relax after your round or to get a little work done to keep up with things back home. In the spirit of Golf As It Was Meant To Be, these four-bedroom cottages are designed specifically to house a foursome. Grove Cottages include four bedrooms, each with a king bed, private bath and a parlor - the largest room in any of the accommodations at Bandon Dunes. Built into each bedroom and parlor are floor-to-ceiling corner windows that offer pristine views of Round Lake to the east, the Lily Pond to the West, or a garden setting. Guests will enjoy an indoor fireplace and outdoor patio tucked into Bandon's natural landscape.